The internet is full of products promising weight loss and fat loss, be it diet pills, supplements, hypnosis or exercise programmes. All come had in hand with drastic before and after photos, but how realistic are they? Be very wary of before and after pictures, even on Kayla’s Instagram. I’ve seen many where the before pictures are taken in bright light (makes you look larger as it hides shadows), slouching with poor posture (makes belly hang out) and at a down wards angle (adds pounds on as it shortens the appearance of your body), then the after pictures look amazingly different. But look closely, a lot have tans which makes you look slimmer, have a hip or leg popped out which elongates your body and have been taken at a more flattering angle. In no way am I trying to be bitchy, I just want you too look carefully before thinking you’re not achieving enough. Plus after all who are they cheating? Only themselves. This is why it’s so important not to compare yourself to anyone else, just look back at your progress and how far you’ve come and realise that you’re doing amazingly! Ok..rant over! Kayla was actually one of the first people I followed on Instagram, I’m not even sure how I came across her but I’m so glad I did. After weeks (months?) of seeing her motivational pictures and transformation photographs I decided to take the plunge and buy her guide. I didn’t think I was going to stick to it if I’m honest but I was going to try and make it through the twelve weeks. After a year of trying (poorly) to lose weight and failing I genuinely believed I couldn’t lose weight. So I was very skeptical about how effective this 28 minute workout could be. If you want to read about why I wanted to lose weight/tone up you can read my original post here. To stop this being a long essay post I've split the information down into easy to read sections. The bikini body guide (or BBG for short) is a twelve week workout plan written by Australian personal trainer Kayla Itsines. It's an ebook so once purchased (costs £38) you will be sent a link to download the file, then you're free to use the guide. I personally printed mine to avoid dripping sweat on my ipad! Gross I know, but it will happen to you too. Within the guide you'll receive twelve weeks worth of exercise and there's also an educational section and instruction on how to do the exercises properly. Throughout the 12 weeks you'll complete three different exercise types: Cardio, resistance and stretches. Depending on which week you are in will dictate how often you have to do each. Later on in the final month Kayla also adds an additional type of cardio called HIIT, you've probably heard of it before, it stands for high intensity interval training. Kayla recommends using running for this, you run 5 minutes as fast as you can and then stop or walk slowly for 5 minutes. The quick raise in heart rate and then returning to normal actually makes your body to continue to burn calories long after you've finished exercises. Which makes it a very beneficial exercise especially if you are short on time. The main chunk of the workouts will be the resistance workouts, which is what you are essentially paying for. These workouts consist of two circuits with four exercises in each, you do each circuit for 7 minutes with a short rest afterwards then you do them both again. So in total a workout is only 28 minutes long and very easy to slot into your day. The great thing about the bikini guide is you don't need a lot of equipment and you could do the whole thing from your home, the only things you'll need are: some hand weights, medicine ball, skipping rope and a bench. Don't worry if you don't have a medicine ball (I don't!) just hold two hand weights together. Same with the skipping rope, you could just air skip if you don't own one or don't have space for it. Also for the bench I just used chairs. Along with the BBG I also purchased the nutritional H.E.L.P guide, although I didn't follow this it's worth reading to understand the kind of foods your body needs. Many people make the mistake of cutting calories to lose weight, but your body needs food as fuel for all the exercise you'll be doing. Cut out all the bad unhealthy foods and you'll see results - just don't over indulge. Who is Kayla’s guide for? Pretty much anyone can do this and benefit from it. If you're looking for fat loss and muscle toning then it's a good workout to go for. Don't be put off about the gaining muscle (I know many girls are), you won't end up looking bulky you look more shapely and toned. Plus muscle is a huge part in fat burning in day to day life, the more muscle your body has the higher your metabolism will be and you'll burn more fat and calories just breathing. If you're a complete fitness novice or really out of shape Kayla suggests adding in some cardiovascular exercise into your life for a couple of weeks just to prepare you. I didn't do this and I was pretty unfit and I've managed to complete it without any issues. I've seen a lot of different kinds of girls do the guide and get amazing results from it, from mums who want to get back in shape after babies to people that already have quite toned bodies but want to push themselves that bit more. Me for example I know the basics, eat well and healthy, exercise and drink water but when it comes to the specifics I’m pretty clueless. I own a gym membership but whenever I go I always end up just making on the spot decisions for what to do, 20 minutes on the bike, swimming and random weight machines with a few sets of 20 at a weight I think is right. Due to this mix matched inconsistent workout schedule/routine I just wasn’t seeing the results I wanted. I figured if I could find a workout routine I liked and really stuck to it would be the way to go. Simple answer is no. It's not easy and there will be times you want to give up, but you can do it. Push through the wall and the results you see are a massive reward. I tend to find half way through each workout my mind wants to give up (even in the last week), the exercises are a challenge both physically and mentally. So even though your mind wants you to stop your body can actually keep going. That extra push is what will give you the drastic results. At the start I ached so much after the workouts, especially after leg day, stairs became like everest and getting up and sitting down was torture! This didn't last very long though and after a month of my body getting used to workouts the aching subsided and wasn't too bad at all. The exercises get harder the further you progress into the guide but you'll equally be getting stronger and you'll be able to push yourself even more. When did I start to see changes? I saw changes very quickly both mentally and physically. After only a week or two I felt like I had more energy and I was sleeping better. As early week 3 I could see the start of physical changes;my belly wasn't so bloated anymore and my calves had made amazing progress from all the walking I'd started doing. Weekly progress photo's allowed me to track my progress and provided the biggest motivation ever. My body was literally changing week by week, exercise became so addictive. I've lost fat, lost inches, lost weight, boosted my immune system, improved my skin and the most importantly I am so much more confident. I only lost 7lbs on the scale, this is why I really don't weigh myself or focus on numbers too much.When you do a workout like the BBG your body will build and tone muscles so this in itself will add pounds onto the scale but at the same time you're burning off a lot of fat. My 7lbs loss was probably more like over a stone of fat loss with a few pounds of muscle gain. It's about how you look ladies not the number on a scale! Can I do it with injury or disability? I'd recommend checking with your doctor if you have an existing injury or aliment before starting just to be sure. I actually have scoliosis and a deformed vertebra at the base of my spine so I've always struggled with a weak back, in fact in the first month I thought I physically couldn't do some of the exercises. Raised straight leg was impossible, so I replaced it for an exercise I could do. Eventually I found after a month I could do exercises that I never had the strength for before. Yes, yes yes a thousand times yes! 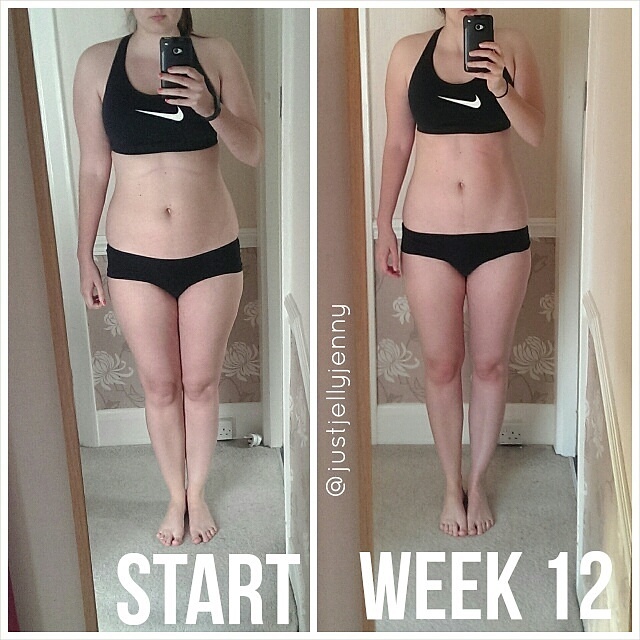 If you want to drastically change your body in 12 weeks do it! You won't regret it. If you put the effort in you really will see massive results. If your new years resolution is to have a more healthy lifestyle then this would be a perfect place to start. The benefits from a healthy active lifestyle are amazing, both physically and mentally. I found I not only lost weight but I lost fat and inches everywhere, especially inches from my waist! I found I was getting less bloated even on my period, I had so much more energy, I didn't get colds or feel poorly, my skin was clear and glowing. The thing that surprised me the most was how fast changes happen, if you look through my previous Kayla posts you can see. Don't forget to use instagram and the hastags for massive support from the fitfam. I find them so motivational and I've met some lovely people on there. I'm on there too @justjellyjenny. 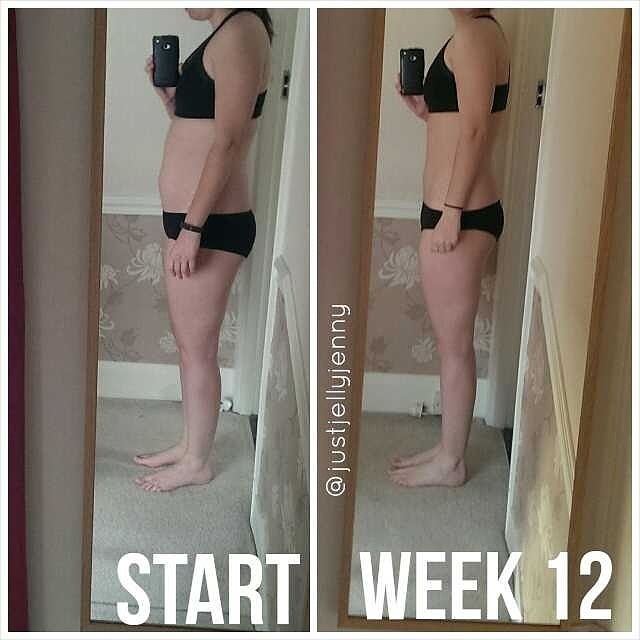 Hi Jenny and cheers on completing the 12 week program and your results are nothing shy of amazing! I am currently on week 2 and found that it is difficult with some circuits for me to complete more than one round within the 7 minutes, most times I try to push myself to complete 2 rounds even after the 7 minute timer starts to beep! I've had a few comments about the bad review on that website, I personally love the guide. The workouts work if you put the effort in, yes they are quite pricey but the community that comes with BBG is amazing. There's such a following on instagram that they help to motivate you - something that you wouldn't get with a free program and something that I value so much. I don't think buying both the nutrition guide and the workouts are a must, the workouts alone are enough to get results. I've also tried Way of Grays workouts, which have a cheaper price tag so might be worth you having a look at those if you're worried about the price? Sorry I feel really bad for only just seeing all these comments! Silly email put it in my spam folder! By now I've bet you've finished the guide, I hope you did amazingly! I used to complete only one round in 7 minutes sometimes, and tbh if you're pushing yourself and you do one round of exercises with perfect form - then you're doing fine :). WoW!!! Amazing progress! And so inspiring - Im exactly one week into my BBG1 and it's reviews like this that keep me going! How are you finding the guide? The results are so worth all the hard work In the end! Hi Jenny! Thanks for this review. I'm glad to hear that it can be done at home. I was hesitant regarding that factor. And congrats on the amazing results!! Hi Jenny, great results!!! I really enjoyed your review. I am on day one of the pre training. Yikes!! I think this is going to be tough. I really hope I can stick to it. Do you really recommend her guide? Is it really good? Will it help me to lose weight fast? I really need something that is effective.. Please reply. I'm quite new to the whole fitness thing and I haven't tried lots of different guides, so I can only comment on what I've learnt so far. Looking at the review you sent the negative points are the price/no money back guarantee, equipment and it only being 12 weeks long. Truth be told there could be programs that are equally as good and for cheaper but you probably won't get the benefits of such an online community that exists with people doing #bbg and its so motivational and one of the biggest pro's the guide has. Yes you'll need some equipment but I've never done the Kayla guide at the gym and I substitute a lot of the equipment for things I have to hand - Chairs, air skipping, something heavy for weights. It may only be 12 weeks but it sets you up for a fitness lifestyle, you can always repeat your "favorite" weeks and it'll never get easy. You'll be stronger and be able to complete more reps but the workouts will still benefit you. I loved it and I put 100% effort in and I got results that I didn't think I'd get from doing just 12 weeks of exercise. It's not easy and you'll get back what you put into it, some people have bigger changes than others. I didn't lost much weight from it, only 7Lbs in the 12 weeks but this is due to gaining more muscle and losing lots of fat which the scales don't show. Also with her workouts you'll also be doing cardio 3-4 times a week in either HITT or LISS which is great for shaping your legs. Diet is very important when you're trying to lose weight/fat and I know Kayla's HELP guide has had a bit of bad press about being calorie restrictive, I personally didn't use it. I just made healthy choices, didn't drink alcohol, no fast food with an occasional cheat meal so I didn't go crazy without chocolate! Sorry for the essay, let me know if there's anything else you want to know! Hi Jenny! is a really good review! i have a question for you, i know diet is very important , so what do you eat? It more a case of what I avoid, I avoided eating any fast food, cut out alcohol, no fizzy drinks and kept sweet cheats to a minimum. A general day for me is cereal for breakfast, I snack on lots of fruits in the day, lunch could be some hummus and pitta and dinner something like chicken breast with vegetables. I always drink lots of water - it makes such a difference...even if you will be peeing every 30 minutes! Hey Jenny! The results look amazing! I wanted to try out the exercise myself but I was really afraid as I have scoliosis as well and its on the borderline of surgery and some of Kayla's exercises consist of sit ups and my chiropractor reminded me to not do sit ups as it might hurt the spine. But since you finished the 12 weeks, I was wondering if it hurt or would any of the exercise hurt the spine? Thanks! I think you have to listen to your back and if a specific exercise hurts maybe switch it out for one that you can do that works the same muscle group? For me I found straight leg sit ups and jack knifes impossible at the start, I genuinely thought my back just couldn't do them. But turns out that once I strengthened up my core I could actually do them and I just had very weak muscles back muscles! Sometimes I'd have an achy back after a long walk or workout but I found this was more down to muscle aching than anything skeletal. Sorry I couldn't help anymore. Maybe show your chiropractor Kayla's seven day free trial and see what he thinks of the exercises and whether you could do them? I'm thinking about buying Kayla itsines guide in your honest opinion is it really worth it? I've been reading a lot about it and there is so many mixed reviews out there...this web page has some good points too - http://www.bikinibodyguidereview.com she also mentions an alternative and I'm thinking about getting it because it's a lot cheaper. Have you heard of it? Did you do the whole diet as well or did you just stick with the workouts? Thanks for doing the review of the Kayla guides. I've just purchased the guides but have been putting off starting them and just begun to read through all the information that briefs you on the guide. One small question is on the weekly exercises; when it lists the exercises for week 1 & 3 do you do all the exercises on that page or one of the circuits in week 1 and then the other in week 3? I do apologise if this seems a novice question! 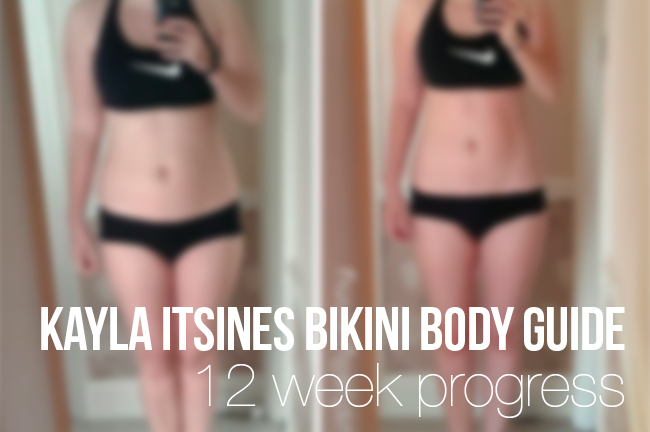 Your results are looking amazing on these guides and it's given me good motivation to start! Sorry to jump on in here, I'm also doing the guides at the moment and thought this might help answer your question. You always complete both circuit 1 and circuit 2 each time you work out, no matter which week you are on. Circuit 1 - 7 minutes, circuit 2 - 7 minutes, circuit 1 - 7 minute, circuit 2 - 7 minutes. As for progressing through the guide you use week 1, then week 2, then week 3 (which you go back to week 1 & 3 pages) and so forth. There is a fantastic facebook group called KI BBG you should join - there are so many girls on there that can always help with any questions you have. Plus they are great for motivation.